Baltimore County schools’ financial disclosure woes may extend even further than anyone knew – and with no end in sight. John Mayo, PhD., the district’s chief human resources officer and former assistant superintendent, is the latest to be flagged with anomalies found on his financial disclosure forms, having omitted work The Baltimore Post found he performed in 2013 as a master teacher for now defunct educational consulting firm, The SUPES Academy. After prosecutors announced indictment charges in January against Baltimore County schools’ former superintendent, S. Dallas Dance, PhD., The Baltimore Post requested the financial disclosure statements for several Baltimore County school employees. What The Post discovered was that news about Dance’s indictment seemed to trigger some employees to disclose outside work and positions retroactively, in which their legal forms were amended to include side jobs and positions not previously disclosed. But what The Post also discovered were omissions that remained for some employees. In particular, those for Mayo, who records now show was also among a long list of master teachers and coaches hired by SUPES Academy in 2013, along with Dance, who was convicted on perjury charges in March — in part for failing to disclose nearly $90,000 he earned from SUPES and its affiliate company, Synesi Associates. But despite a recent amendment made to Mayo’s 2016 disclosure statement, he continued to withhold information about his relationship with SUPES, and any consulting work that ensued. Beginning in the summer after the school system entered into an $875,000 contract with the consulting firm under Dance’s direction, records show that Mayo, along with Dance, acted as a master teacher for the company, providing professional development for Chicago Public School (CPS) principals in 2013. The Chicago Executive Leadership Academy – or CELA as the SUPES program was called – was the creation of CPS’ former chief executive officer, Barbara Byrd-Bennett. The program would be criticized by some principals for lacking substance and wasting administrators’ summer weekends. But, Byrd-Bennett, who pushed the no-bid contract through for the principal development training, and had previously worked as a SUPES consultant, had personal motives for the training program. Along with SUPES’ owners, Gary Solomon and Thomas Vranas, Byrd-Bennett conspired in an elaborate kickback scheme to defraud CPS, in which the former education leader would earn 10% commission on the $20 million SUPES contract and any contract brought to SUPES, thereafter. The three also agreed that Byrd-Bennett would be compensated for selling other superintendents SUPES contracts for their school systems for which, indictment records show, Byrd-Bennet was promised both compensation and jobs for her friends. Leaders from across the country were hired by the SUPES team in order to provide $20 million dollars’ worth of professional development to Chicago principals through Chicago’s CELA program. Among those leaders were Dance and Mayo. But it wasn’t until a list of those SUPES consultants was provided to The Baltimore Post earlier this month by Chicago-based investigative reporter, Sarah Karp, that Mayo’s financial disclosure omission became clear. Karp broke the SUPES Academy story in 2013 that led to the federal convictions of Byrd-Bennett and her co-conspirators. The veteran reporter was nominated for an award on her reporting of the SUPES scandal which also outed Dance and others as school leaders moonlighting as SUPES consultants. Karp found that in at least six cases, school leaders were not only employed by SUPES, but also had school contracts with SUPES or one of its affiliate companies, Synesi Associates and PROACT Search. Baltimore County Public schools was one of them. Yet, until Karp’s discovery, the Baltimore County school board was unaware of Dance’s moonlighting with the company. As a result, Dance was found to have violated his employment contract when he failed to disclose the job. State Delegate and former Republican candidate for Baltimore County executive, Pat McDonough, filed an ethics complaint which triggered the investigation into Dance. Like Dance, Mayo also did not disclose his relationship with SUPES on legal documents he signed under penalty of perjury for the 2013 reporting year. Unlike Dance, however, knowledge of Mayo’s involvement failed to come to light – until now. Dance is currently serving time in a Virginia jail for failing to disclose on his disclosure statements, roughly $147,000 of income he earned moonlighting for reporting years 2012, 2013 and 2015. Prosecutors found that roughly 62% of the income – or $90,000 – was money he earned consulting for SUPES Academy. And, like Byrd-Bennett, the roughly $90,000 Dance earned through SUPES and Synesi totaled about 10% of the contract he signed with SUPES for Baltimore County schools. Byrd-Bennett and the SUPES owners are currently serving federal prison sentences for lesser charges related to the kickback scheme which involved paying Byrd-Bennett 10% commission for the no-bid contract with CPS. But even despite Dance’s own legal troubles in Baltimore County, and the intense public scrutiny of interim Superintendent Verletta White’s failure to also disclose income, Mayo – and others – have remained silent. White, who replaced Dance after he resigned last year amid a criminal investigation, was also found to be in violation of her contract after a November story by The New York Times reported her consulting job with ERDI, the Education Research and Development Institute, an education consulting firm that pairs its paying clients with school system leadership that ERDI, in turn, pays. The Times’ article triggered an ethics review after a Perry Hall citizen filed the complaint. Yet, throughout the ordeal, White has maintained that the nondisclosure on her forms was not to mislead, as prosecutors found was the case with Dance. White has also not been charged with any crime related to the indiscretion for which she has apologized. But, until now, the interim Superintendent has been positioned as an outlier for her disclosure error which makes Mayo’s failure to disclose his consulting position, over all of these years, puzzling. Like Dance, Mayo is a graduate of SUPES Academy, according to a document found by The Baltimore Post. Both also worked at Henrico County Public Schools as school principals. 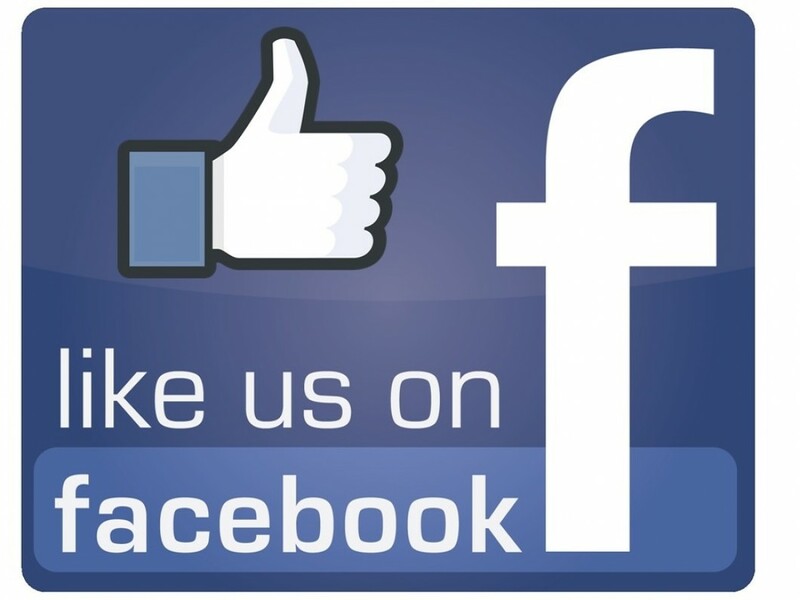 The friends and former coworkers are also both graduates of Virginia Union University. Dance hired Mayo in 2012 as an assistant superintendent of middle schools for Baltimore County schools. Mayo was then promoted in 2014 to the system’s chief human resources director. In February, The Baltimore Post requested the financial disclosure documents for Mayo, along with several district employees. Mayo’s forms disclosed a limited liability company he created in July 2013 – Commonwealth Educational Consultant Services – or CECS, LLC. But he did not disclose any income earned, nor did he disclose any employment with SUPES Academy, a school system vendor which – under Schedule E on the disclosure document – is required to be divulged by district employees. In fact, despite having created the consulting company in 2013, he did not declare any income made through it at all. And on his financial disclosure statements, Mayo only disclosed earning any income outside of the school system one time. But it was a disclosure that came only after The Baltimore Post inspected Mayo’s statements the first of two times when the HR director then added a speaking engagement from two years prior, income he earned as guest speaker for the American Association of School Administrators. More puzzling is that in between the two record inspections by The Baltimore Post, Mayo also dissolved his consulting company, state records show. April 13, 2018 – Mayo modified disclosure form from 2016 reporting period. April 16, 2018 – Mayo dissolved his limited liability company, CECS, LLC. In March, The Baltimore Post published the first of two stories on the district’s executive director of innovative learning, Ryan Imbriale. The Post reported the district’s ethics department had destroyed original financial disclosure documents after Imbriale had amended his forms many months after the original filing deadline. In one case, Imbriale’s disclosure statement had been completely replaced 19 months after its original filing deadline. Andrew Nussbaum, an attorney who advises the ethics department, told The Baltimore Post earlier this month that he was told the destroyed records were due to a one-time clerical error. However, no one could explain to The Baltimore Post how it was an error limited only to Imbriale. One that occurred – not once as Nussbaum was told – but twice. Another omission, unaddressed on the financial disclosure statements, is the subject of gifts. The forms require district employees to list things such as meals, theater tickets and even books. Not a single employee, researched by The Baltimore Post, declared a single gift over the last five years. Despite those omissions, The Post found in emails obtained through a Maryland Public Information Act request, that multiple employees of the system were invited to several conferences over the years. In one email, Baltimore County schools’ employees, including Lloyd Brown, Jeanne Imbriale, Ryan Imbriale and others were invited to a meeting hosted at a conference center by school system vendor, McGraw Hill Education. Records show that at least nine Baltimore County schools’ employees were invited to the meeting in which dinner was provided by the vendor. State law requires the school system to come up with a policy for the retention of records. 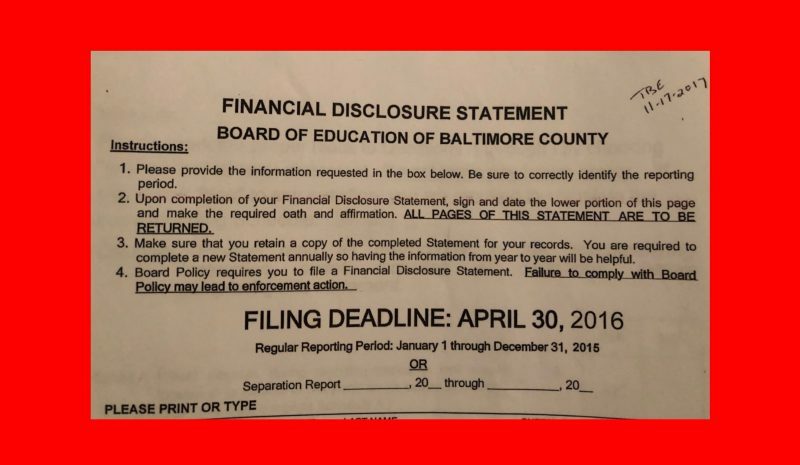 In Baltimore County schools’ case, its ethics policy mirrors state law in that the school system determined that its financial disclosure records must be retained for no fewer than four years. But the ethics department lacks an ability to subpoena – or force companies to turn over financial records – in order to vet statements made on those forms by employees. As a result, employees are essentially on an honor system to disclose information willingly. But they do so under a risk of penalty of perjury. The Post reached out to Mr. Mayo and Mr. Nussbaum, asking about Mr. Mayo’s failure to disclose his relationship and any income made working for SUPES Academy, as well as why income was not declared a single time through his consulting company in the five years he owned CECS, LLC. There was no response, nor any official statement from the system’s ethics department regarding the omission on Mayo’s financial disclosure statement.